I don’t know who said, “A picture is worth a thousand words.” So this image is not so much a picture, but it really spoke to my spirit this morning. It reminded me of a few other lessons I try to incorporate in my life. One being HALT (hungry, angry, lonely, or tired). If I am any of these, I need to halt before speaking or doing anything. When I am hungry, physically not emotionally, I need to eat something. When I am angry, I need to calm down. When I am lonely, I need to find a way to socialize with someone. When I am tired, I need to take a nap. I need to do all of these things BEFORE I say or do anything, which I may later regret. Then there is the Sufi teaching, which reminds me that BEFORE I speak, I must answer three questions: is it truthful; is it necessary; and is it kind. If they are not, then I do not need to speak those thoughts into being. 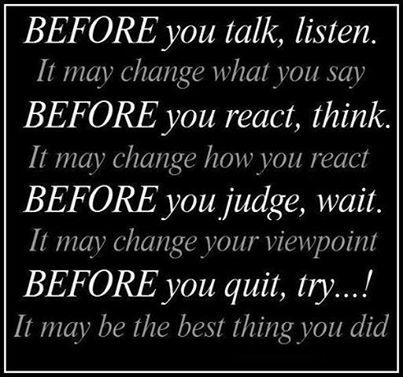 I need to remember to think BEFORE speaking or doing.